Reycita Garcia of San Juan Pueblo relishes the soft hues of earthen colors, but her figures are "westernized." St. Joseph is dressed cowboy style, the child wears Doctor Denton's baby pajamas, and Mary proudly shows off the many buttons of her dress. However, the special feature of this set is the frog. He is a storyteller. Frogs are figures of wisdom and symbols of transformation. He tells the story of life from its simplest expression in water and mud to the coming of Jesus, the life-giver himself. 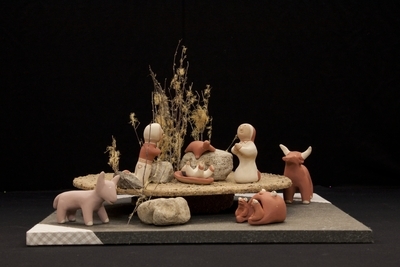 Handsculpted and glazed clay figurines depict the nativity of Jesus, created by Reycita Garcia of San Juan Pueblo, New Mexico in 1999. Exhibition label originally written by Fr. Johann G. Roten, S.M. for exhibit entitled "At The Manger" and held at Roesch Library, University of Dayton.